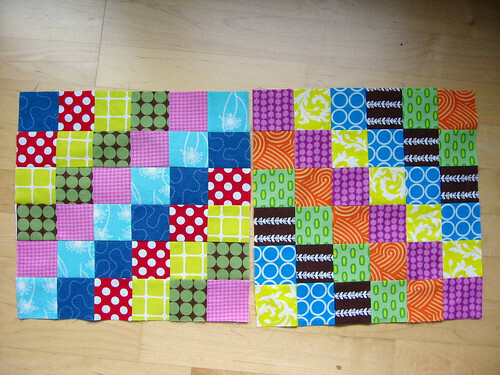 Needle and Spatula: Bee blocks and getting ready for Sewing Summit! 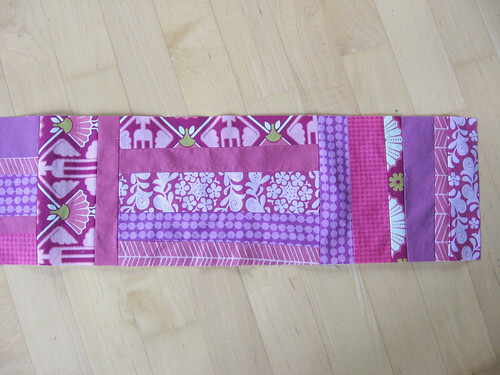 With everything we had going on, I waited until the very end of the month to sew my September blocks for the do. Good stitches bee - which was actually a long strip, rather than 2 blocks like usual. Natalie asked us to use our imaginations and we each stuck to a single color - I got plum and others did red and golden yellow as well. 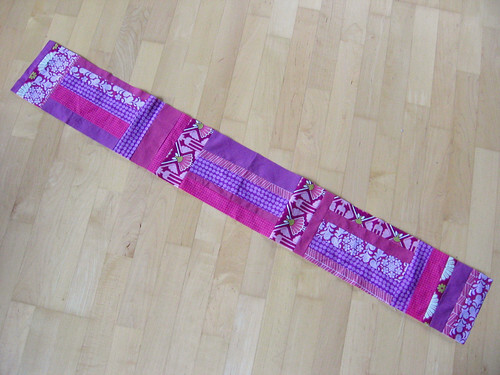 As usual, Natalie picked a gorgeous color palette and I can't wait to see how the final quilt turns out! In a stroke of luck, Melanie of Texas Freckles had already posted the block design for October when I was working on my September strip, so I was able to do both at once. She had us make trip around the world blocks using this great shortcut, it was super easy! This was a fun block that I probably wouldn't have made otherwise, so I am glad I got a chance to try it out. I am super excited for the Sewing Summit tomorrow! There has been a kind of insane amount of email traffic on the listserv that I have been doing my best to keep up with, but I am hoping that I'll be able to just jump into things when I get there even if I haven't been completely keeping tabs on all the goings on in advance. 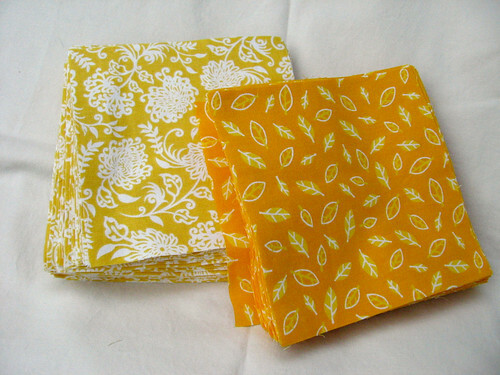 I did sign up for both the fat quarter swap and the charm square swap, so I have been pulling fat quarters from my stash to part with, and I bought two yards of fabric and cut them up into charms (good practice for the charms I'll be cutting for my Drunkard's Path quilt!). It is a rainbow charm swap and I was assigned yellow and yellow-orange, so this is what I came up with. I can't wait to see all the different fabrics I will be getting in exchange!! 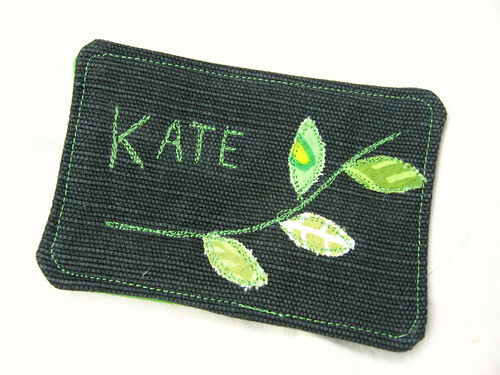 I also saw that a number of folks have been making themselves nametags for sewing summit, and I was inspired to make one too, although not patient enough to hand-embroider it. Instead I went for a free-motion embroidery/applique design inspired by the leaf design on my messenger bag pattern. It came together really quickly and I am happy to have something new homemade for the sewing summit since I didn't make a new bag or anything. Oh, and I have been remiss in not giving an update on the Bloggers' Dinner Party! It has been fun doing this party, but I think I have too much going on to keep it going any longer - so it will be retiring, or at least hibernating for now. I may do one more month in December so folks can link up holiday projects. Thanks again to Michelle from City House Studio for hosting this past month!! Have fun at the summit. Anxious to read all about it. Have a fabulous time at the sewing summit!! From all the blog posts, it sounds like it's going to be a blast. Totally kicking myself for not going!